So, what’s your Amazon power animal? This sounds like one of those Facebook surveys doesn’t it? Like, “what city should you live in? What colour are you? If you were a tree, which one would you be?” So, before FB, there was the Amazon Jungle, and many tribes within it. And, apparently, just by answering a few simple questions, local tour guides from these tribes can tell you what your Amazon spirit power animal is. Yay! We can finally know – are you agro alligator, cheeky monkey or sneaky slimy anaconda? Colourful toucan perhaps, or my personal favourite power animal – the three-toed tree sloth? Having just spent 5 days hacking our way through jungle vines and alligator invested waters, I would say I am definitely the sloth. 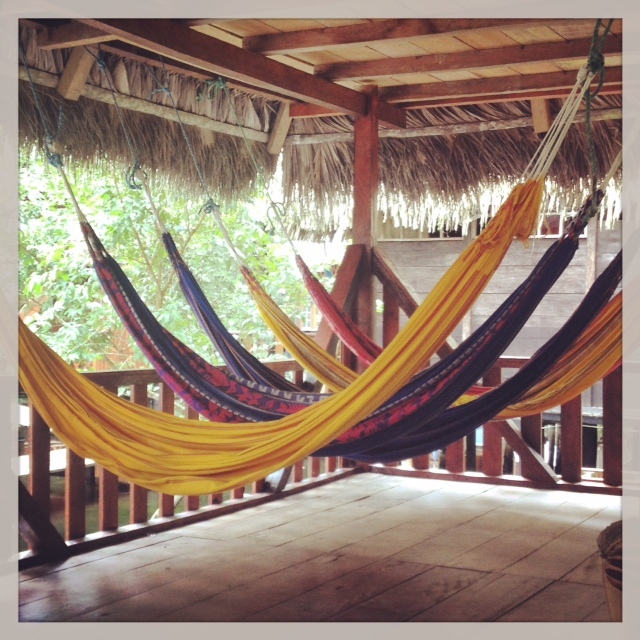 I much preferred the laying around in hammocks day dreaming and reading rather than the chest-high-swamp-trekking. I’m sure a lot of you would be with me on this one. A guide from another group agreed with my self-assessment of me as a sloth, which was ‘proven’ through a fool proof power-animal-questioning tool. Are you ready for the fool proof question? You too can discover your power animal! Ok, so imagine you are in the jungle (insert humidity, insects, canoe rides, leeches, amazingly tall trees, screeching birds, tree-swinging monkeys etc etc), and you are walking (hacking) your way through it when you reach a brick wall. Looking both ways you can’t see the end of the wall, and looking up you can’t see the top. After some exploration of the wall you confirm that there’s no way around it or over it. What do you do? Ok…… So what did you say you would do? Share it with the person next to you (especially if you are reading this on the bus or train). Your answer to this question will reveal your power animal!! It’s that easy. For example, if you said you would bash through it, this indicates you like changes in life and you are a…. Butterfly 🙂 If you said you wouldn’t do anything and remain on your side of the wall, then welcome to the kingdom of sloths!! For every other response there is a power animal. 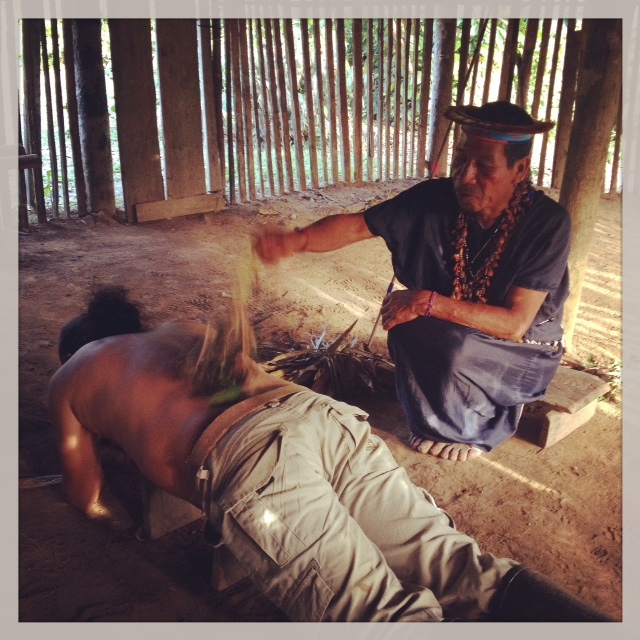 This fun tone turned a little more serious when we went to visit the local shaman, as you do. It soon became obvious how genuine their belief in the animal spirit world is. Our crazy, joking, boat-rocking guide suddenly spoke seriously about the process which the shaman goes through in accessing the animal spirits while healing others. Not an eye flinch between them when speaking about chugging down the hallucinogenic healing plant Ayahuasca and communing with the jungle animals to get their assistance in removing the dark energies from the person the shaman was trying to heal. Being in the jungle it made sense to me too…the animals rule this huge sprawling dominating jungle. Even while lying in my hammock they were never out of swat-distance or ear shot – birds screeching, monkeys hooning past. The animals are truly kings there and we are the town jesters surviving our brief moment of wilderness living. The tribes who live there do so with respect for the animals and their spirits. If I lived there (never happening by the way) the first thing to do would be to seek the animals’ permission; throw some Ayahuasca down and get in touch with those Amazon animal spirits, ’cause you gotta make friends with the locals right. 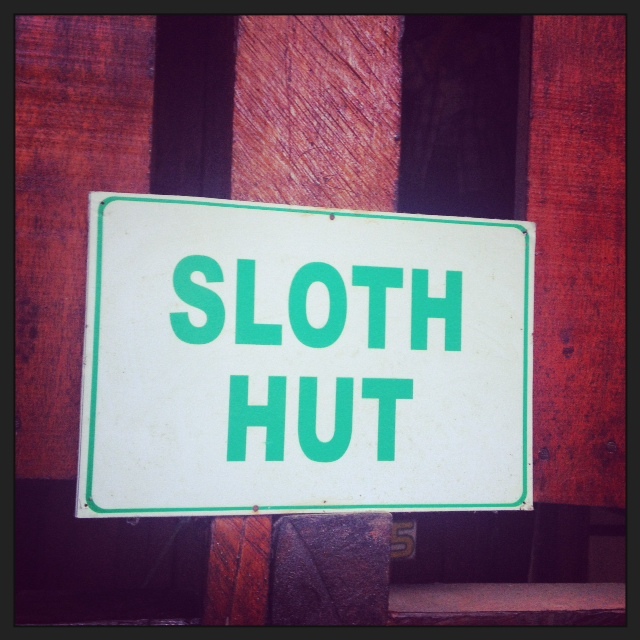 So, I’m happily getting used to my sloth-power, finding the power in stillness and slowness. What do you think is your Amazon power animal? The Galapagos Islands, Ecuador. Smack bang in the middle of the Pacific Ocean, literally hundreds of kilometres from anywhere. I am half way around an island-hopping adventure tour of the islands, and it’s phenomenal. Known for its unique, strangely mutated animals and being the inspiration for Charles Darwin’s theories of evolution and the survival of the fittest, it’s mind-blowingly different and it’s had me amused and thinking. While listening intently to our local guide, an Ecuadorian David Attenborough, I am struck with our human desire to protect life, and to encourage life to continue and flourish. We want life to go on, and are constantly rooting for it… So to speak. Two events in particular had me thinking about Darwin’s survival of the fittest theory, and even where we humans sit within it all. Is compassion one of our strongest survival secrets? Our first day on San Cristobal Island was awesome. 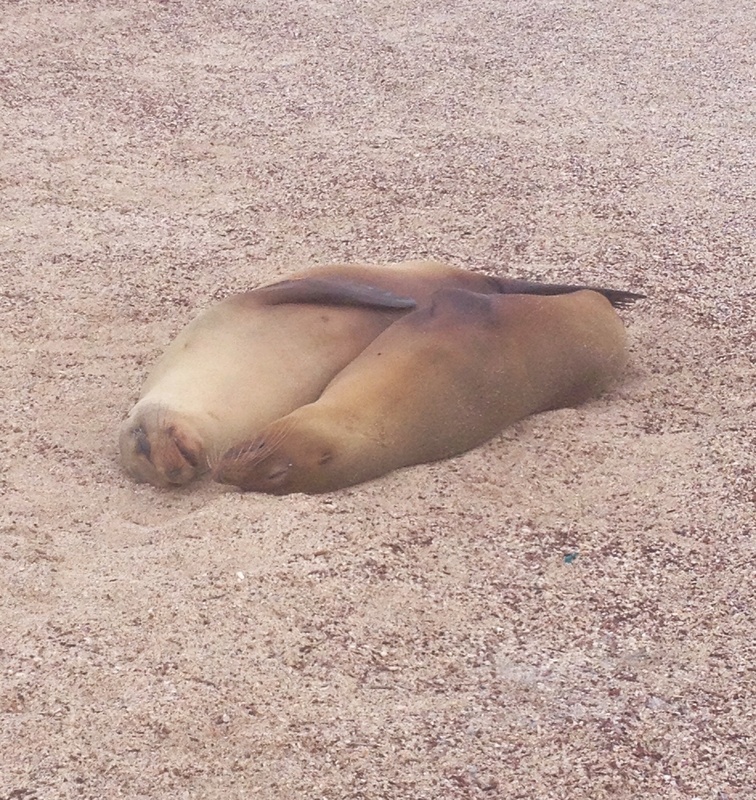 We stepped around a corner onto a beach littered with shiny, beautiful, playful sea lions. [Insert squeals of delight.] They were lazing along the beach, cuddling, warming themselves, and frolicking in the bay. We dove in and had our first of many encounters with the gregarious pups. My brother jokingly pushed me towards one of the larger male sea lions until it advanced on both of us and we retreated as quickly as our big feet-fins could take us. An early lesson in choosing your sea lion playmate. The playful day ended sadly, as there was one tiny sea lion pup, just 4 months old according to our guide. He was scouting the beach looking for his mum, approaching any female sea lion and barking at them, hoping to identify himself as the female’s pup. Each time the females would bark loudly back, aggressively rejecting the pup. Our guide explained that 3 out of every 10 pups will die, having become separated from their mother and unable to survive alone. “And no adoption here”, claimed ‘Attenborough’. Battling to protect their own pups, taking on another’s pup is not ever considered. The pup followed us up the beach, barking and crying, looking for some food, some warmth, some love from other sea lions. He hobbled along, and I had to quicken my pace, to avoid picking him up and taking him home. I later learnt that the naturalists of the islands are against human intervention to assist in survival, as it’s considered a part of the natural ecosystem, or “the circle of life” if you will. The sea lion population is healthy and carcass of a dead sea lion pup maintains many other animals on the islands. 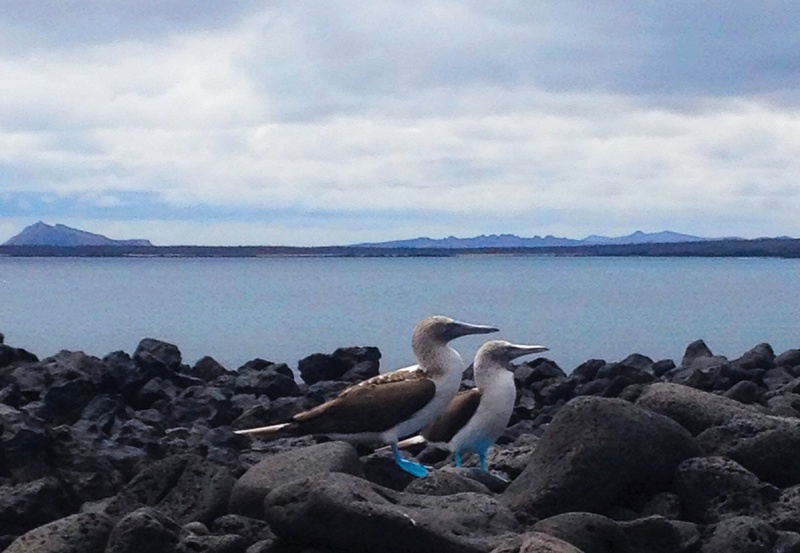 Struck in the face with the reality of ‘survival of the fittest’, I was much happier the following day to witness a much more fun part of this survival phenomenon – the mating dance of the Blue Footed Boobie. Yes, a rather regal bird, endemic to the islands, it’s like a prettier, taller, leaner, stronger seagull, with shiny blue feet. Lucky enough to be on the islands in mating season, our group stood amused and intrigued for a good 20 minutes, having stumbled across a male and female Boobie engrossed in their mating dance – an entertaining sight. The male kicks it off with a kind of ridiculous forward moondance, and stands high on large rocks, all in an attempt to show off just how blue his feet are. The bluer his feet, the more likely he is to get some female action. The female plays the aloof game, facing away for part of the dance, waiting to make sure she is making the best choice she can, for that season anyway. Then, when she is sure he is quality, she begins gurgling her neck and flapping her wings as signs of affirmative action. What struck me (other than just how funny this all was to watch), was our human desire to see the Blue Footed Boobie get some action. We didn’t care too much for actually seeing the final deed, yet all of us in the group were rooting for them to get together. We wanted them to win, to get it on, to keep going, to survive. Each time he turned away we collectively groaned in pain, and each time they moved closer to each other we leaned forward in anticipation. In both cases, with the sea lion pups and the Boobies, we cared about their happiness and their survival. It doesn’t make sense to us, as humans, to leave our human ‘pups’ to fend for themselves, even if they aren’t our own. We have adoption, and fostering, and larger family, who we call on for help when we need it. And when we go out with our friends, we want them to get lucky, to pick up, to find the man with the bluest feet. Because we have compassion for each other, we want others to be happy, and want the very best for them. Perhaps our compassion is our key to survival. We aren’t the strongest animal, or the biggest, or most beautiful, but we are connected and we care about each other. So as a whole species, we are fit when we care. Of course, at times we lose track of ourselves and others; we get tired, and busy and needy in ourselves. But overall, when the big questions and decisions come, we must continue to truly care. When given the opportunity to care, we must pick up and love our baby pups, even when they are not our own, and we must choose the bluest feet around, always. It’s a matter of survival, don’t you think? So you may be thinking…an odd start to a trip in South America…did Kerryn get the wrong plane and end up in Egypt…Isn’t South America very Catholic….and what does this camel have to do with anything? Well, in the first few days in Ecuador I have discovered this old proverb and realised its relevance everywhere. If you hear me out I’m pretty sure it’s relevant for us all. 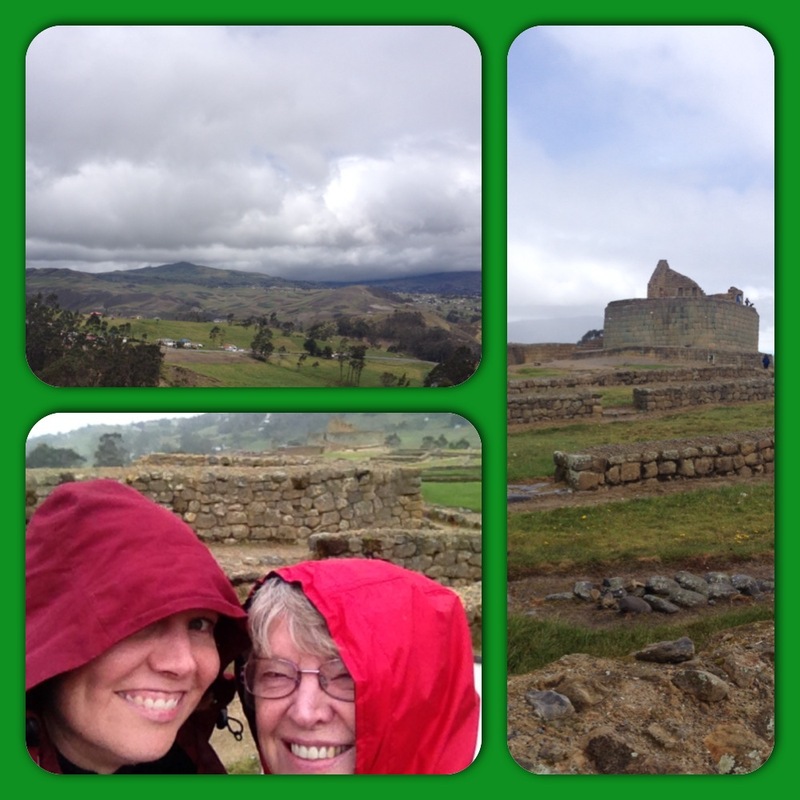 While staying a few days in Cuenca, Ecuador, our main (only) “must do” was an old Incan site called Ingapirca, the only remaining Incan site in Ecuador, high up in the Andean mountains. The helpful tourist centre had given us pretty clear instructions, so rather than take an expensive day tour we opted for the local bus option. It sounded straight forward enough: 2 hours, one bus, site tickets on arrival. Feeling quietly confident we headed down to the bus station early, silently and unknowingly trusting in Allah as we went. Bam! Welcome to Ecuador! You gotta love a third world bus station yeah? From the second you step inside your senses are on demand. Stalls with names of towns you could only pronounce badly; street hawkers selling all forms of tasty delights; kids weaving; tourists floundering; buses bellowing at you to leave ten minutes ago. It’s proverbial mayhem and it’s great. I am traveling with my lovely mum at this stage, and as we stand taking it all in and trying not to look too bewildered, a man approaches me and asks where we are going. I manage to say we are going to Ingapirca in my terrible Spanish and he ushers us towards another man, yells “Ingapirca” at him and nods his head emphatically at us, indicating we go with his mate/colleague/fellow con man. See, it’s at this stage the trust comes in. Mum hesitates, a fair response given these are unknown men in a country where every travel guide warns you of scams around every corner, and fair game we are right now! But at that second I choose to go with trust. In Allah, in Buddha, in God, in Ecuadorians. Trust in the fact that we are now being guided into a agency’s hole in the wall, where the man gives instruction to the long haired woman behind the counter that we want to go to Ingapirca. No scam, just friendly helpful (business) people. In a matter of minutes we have our $2.50 bus tickets, a warning from the women to watch our bags on the bus and are being again ushered onto bus number 7, bound for Ingapirca (via everywhere). Sweet. We sit, clutching our bags obviously casually, amused and entertained by the range of (always short) Ecuadorians clambering onto the bus, shoved and barked at by a red-faced round man who will accompany the bus all the way to Ingapirca, shouting destinations and ticket prices as locals climb on board in the middle of nowhere and jump off in the middle of nowhere else. Our second Allah-trust choice came a few seconds later. Our red faced man had some competition, by a wiry pale faced young man who jumped aboard and began what can only be described as a rant at the front of the bus. His words way too fast for us to even try to understand, mum is sure she heard the word ‘immune’ before he started to hand out small caramel lollies to all. First instinct was of course that he was selling them. But as we watched him move down the bus he gave them out to all without collecting any dollars in return. Disbelieving but stocked, I happily took three of the offered caramels. Ahhh so trusting. But no Allah here! His second trip down the aisle was to collect our pennies. Red faced man and pale wiry man started to go head to head. Red Face pushed through the standing people to get to Pale Wiry, in attempts to get him off his bus. Pale Wiry stood his ground, his rapid fire of words like caramel bullets, dodging the other passengers and aimed directly at Red Face now. There is however nowhere to hide on a bus, and Red Face had the home ground advantage (it was his bus after all). Pale Face cut his loses, grabbing any 25 cents he could get from us as he was dragged off the bus. Always in favour of an underdog I tossed him 30 cents as he hightailed out. I was still laughing ten minutes later, at Pale Wiry’s business gusto and my forever naïve belief that we were getting free caramel. Mum was the one who put the morning’s events into perspective. “Trust in Allah but tie up your camels” she said. “I’m sorry, what?” Mum repeated it “something my friend told me once, trust in Allah but tie up your camels”. Its best to have faith and trust in our gods, the universe or the good of people, but don’t be so foolish to lose all your camels along the way. So I was glad we had trusted in our first two men at the bus station, as we plodded along in our entertainment bus to Ingapirca. Perhaps next time though I will take more time to tie up my camels, or I’ll end up with more unwanted caramels. Whatever else you do this week, remember to take a moment to trust in Allah, but watch out for Pale Wiry men selling caramels.